Factory MSRP: $86,850 2019 Toyota Land Cruiser Blizzard Pearl As part of the Toyota family, your exceptional ownership experience starts with ToyotaCare, a no cost maintenance plan with 24-hour roadside assistance.The ToyotaCare plan covers normal factory scheduled service for two years or 25,000 miles, whichever comes first. 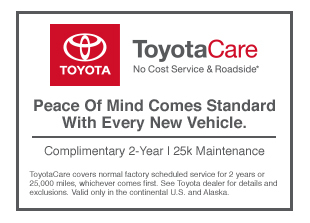 24-hour roadside assistance is also included for two years, regardless of mileage. New vehicle pricing includes all offers and incentives. Tax Title, Tags, Dealer, and $748.75 Document Fee not included in vehicle prices shown and must be paid by the purchaser. While great effort is made to ensure the accuracy of the information on this site errors do occur so please verify information with a customer service rep. This is easily done by calling us at (502) 565-0086 or by visiting us at the dealership.